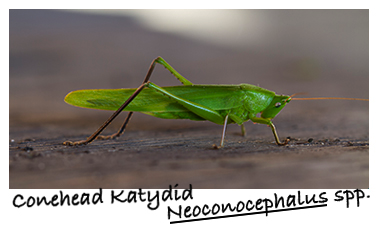 — Conehead katydids are also known as long-horned grasshoppers due to their long, slim shape. several times, finally getting wings during their final molt. — Although some katydids can take to the air, they are generally known as poor fliers. — Female katydids are typically larger than males. — Their relatively long hind legs are used for jumping. — Males will climb onto plants and rub their front wings together to "sing" at night to attract females. "Katy Did, Katy Didn't, Katy Did, Katy Didn't, Katy Did, Katy Didn't..." But not all species make this sound. with the plants they feed on, helps to conceal them too. — Bats, that listen for the katydid's "love song," are one of their main predators. — Katydids are solitary critters and finding one doesn't mean there are others around. 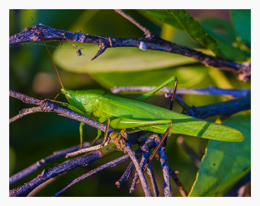 — Although they aren't usually found in groups, katydid's can sometimes be crop pests. — Katydids may bite when handled. — Insects are in the class "Insecta"
— The Conehead Katydid is in the katydid family "Tettigoniidae"
— It's genus is "Neoconocephalus"
— Species in the genus are considered "Common Coneheads"